In our opinion, a trading journal is probably the most recommended trading software for any serious trader. Whether you read a trading book, a trading website or talk to professional traders, a trading journal and a way of record keeping are mentioned as a necessary step of trader development. We have found that Edgewonk was an easy to use software for analysis while providing statistics that are beyond just pure numbers. For example, Edgewonk uses a variety of features that specifically help traders work on their emotions and trading psychology, such as the Tiltmeter or the Trading Sessions. The Tiltmeter analyzes the level of discipline and how well you respect your rules and shows your weaknesses. The Sessions-feature allows you to create an effective review and journaling routine. Up until now, most traders have used self-made Excel spreadsheets or loose Word documents as their trading journals. Sooner or later – mostly sooner – those turn into data graveyards and traders will abandon their journaling routine because they don’t see the benefits. Edgewonk now offers a professional and easy to use solution that makes journaling a fun experience and the automated analytics provide valuable insights into your trading immediately. The Edgewonk interface is very clean and it does not take long to get used to it. 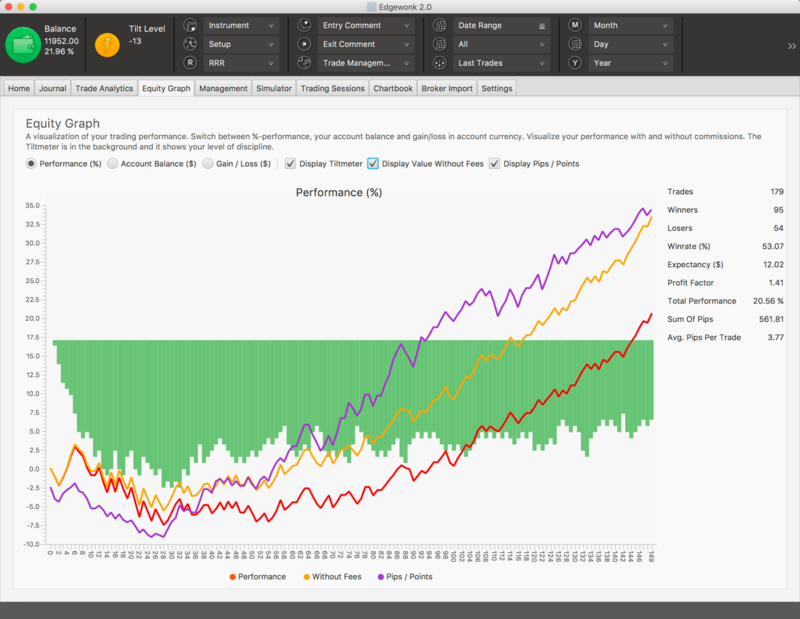 In the Home-Screen traders get the first breakdown of their current and weekly running performance. Of course, the other tabs provide much more detailed insights as we will see shortly. 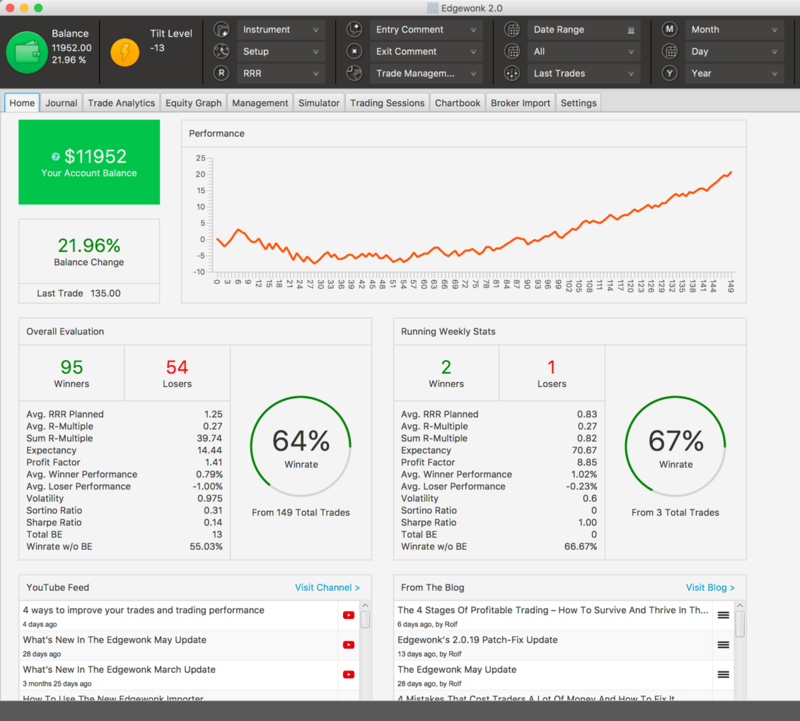 Edgewonk uses a trade-entry mask where traders make their trading input. Currently, Edgewonk does offer statement imports for Sierra Charts and other platforms (more will be added in the future) for even more effective data input. Here, Edgewonk is completely customizable and it works for all international markets, all asset classes (except for options), all currencies and trading instruments. 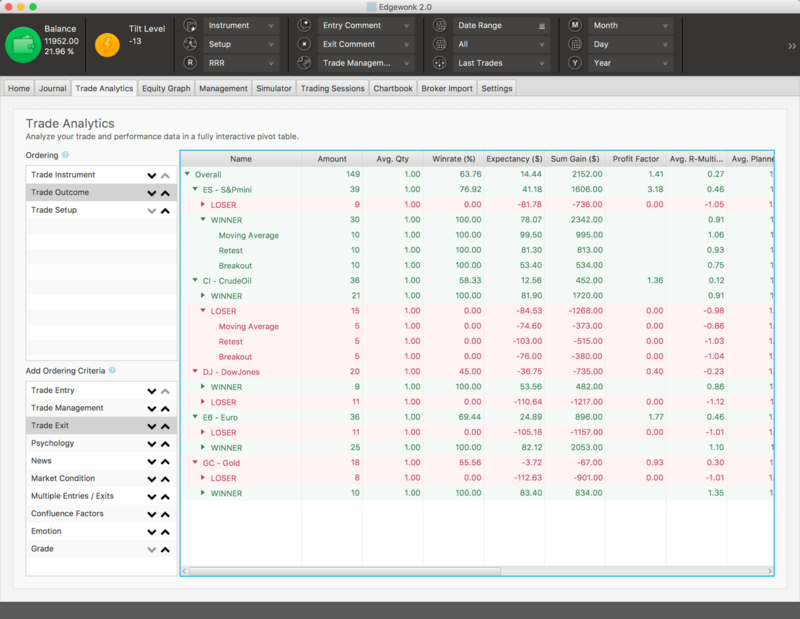 You can track your own strategies, set up your own individual setups and then tag trades to get detailed insights. With their so-called Custom Statistics, you can create your own categories of tags and things you want to analyze in your trading (timeframes, emotional factors, patterns, news items, profit taking and entry strategies and more). There is a small learning curve since some of the metrics are proprietary and not (yet) industry standard, but their trader development program, which comes with the journal, guides you through the process step by step. You can tell, that the Edgewonk team also is made up of traders and they keep refining and adding new features regularly. Drawbacks: As we’ve said, there is a small learning curve and it usually does take a week or two to get used to it. But if you are overwhelmed, we recommend looking at the trader development to get hands-on instructions. And a trading journal is something you will accompany you through the years, so this short learning curve should not put you off in our opinion. We are truly impressed at Optimus Futures, LLC by what Edgewonk brings to the table and are positive that using their trading journal will provide specific benefits for the trader. 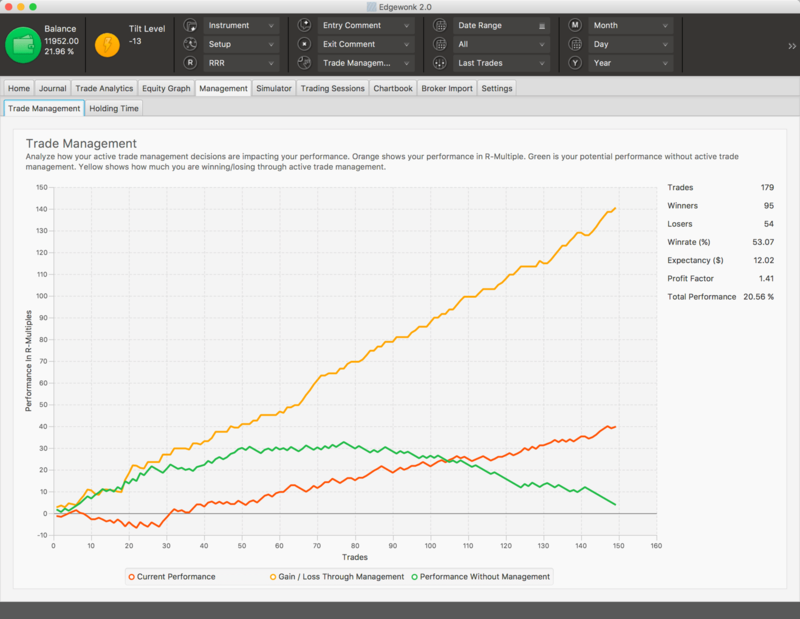 It could help you to build discipline and track trading behavior and performance in a new way to plug a lot of leaks.